Russia's first environmentally friendly pilot house is open to visitors for three months before it becomes the home of a family of five. Russia’s first Active House opened in September. The new architectural project is based on the European concept of green standards. An Active House aims for the optimal balance between living comfortably and saving energy both during and after the construction process. The project was organized jointly by the Danish company VELUX and Russia’s Zagorodny Project. The basis for the design was the Model Home 2020, six variations of which have been implemented by VELUX across Europe. Thanks to its previous experience, the company was able to complete the construction in just six months. The house was built 20 km (12.5 miles) from Moscow on the grounds of the Zagorodny Project. Eventually, the project hopes that 6,000 people will reside here, on the 82.7 hectares belonging to the project. But at the moment, there is just one active house. To a certain extent, the traditional Russian wooden dwelling known as the izba served as the prototype for the Active House. Wood is the house’s main construction material, and like the izba, it is a square building with a number of elements extending out, including a porch, balcony and chimney. Inside, the building is divided into two parts: a public section on the first floor and a private one on the second floor. Facade glazing and skylights create the illusion of open space. 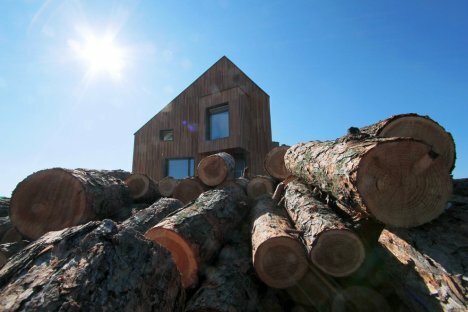 But this little house is full of energy-efficient elements. Hot water and heating will be provided by a geothermal pump and solar collectors; a 7.5-meter (25 foot) solar panel on the southern facade of the building should ease some of the burden on utility systems. Intelligent natural ventilation and automated sun protection will reduce the cost of air conditioning. A weather station on the roof and sensors in each room will generate data to automatically maintain a comfortable climate within the house. Although with a price tag of 28 million rubles (879,000), the house is not for everyone, it is cheap to maintain. According to preliminary estimates, hot water and heating will average 12,500 rubles ($392) a year. Owners of a comparable house that use gas for heating spend twice as much on utilities, and those who use electricity, 17 times more. The real volume of consumption will become clear when, as a continuation of the experiment, a family of five moves in. Although anyone can visit the house during its first three months, after that, it will become the home of a family with three small children. All the data on the comprehensive monitoring of the interior microclimate and energy consumption will be available online. At a press conference on the project, Dmitry Aksenov, chairman of the Zagorodny Project’s Board of Directors, compared the Active House to a concept car. Few people can afford to buy it, but that’s not its primary purpose: rather, it’s to change people’s awareness, educate them, and talk about new technologies and their benefits. For his part, Andrei Bokov, president of the Union of Architects of Russia, pledged to do his best to build model green homes in each region of the country, so that people can see the idea for themselves. Unfortunately, Russia still lacks regulatory framework for green construction standards, but that could change quite soon. “In the coming year, we plan to work with non-profit organizations and professional builders and architects to develop green construction standards for Russia,” Bokov told reporters. He is insisting on creating purely Russian standards, rather than looking to foreign models as a guide.